When you adopt a eating clean regime, and you run out of unsalted mixed nuts for your salads and steel cut oats for your breakfast, the best place to replenish your supply is bulk barn. I walked into the store with the greatest resolve. Steel cut oats? Check. Unsalted mixed nuts? Check. Dried cranberries? Check. Hm. Michael would like some of his favourite sour berry gummy candies. Check. Uh oh. Candy aisle. Next thing you know, a bag of sour grapefruit slices, Dare super soft Ju Jubes, Licorice All Sorts, Scotch Mints (when have I ever liked Scotch mints? Am I getting that old? Will I have Scotch mints covered in lint in my cardigan pockets? ), and ooooh, what have we here? Chocolate malted Easter eggs! Nom nom nom. Of course, now I am suffering a sugar hangover, because I didn’t just eat one of those chocolate malted Easter eggs. Oh no. bulk barn has several locations throughout Edmonton, and one opening soon in Calgary. I suggest you check out their website at www.bulkbarn.ca for locations and hours. For more detail on the place, here’s a great blog entry with beautiful pictures by Crazy White Girl With a Kitchen. Oh dear. Scotch mints are the first sign, you know. Bulk barn rocks. Carries UK candies as you now know I’m sure. Dangerous, very dangerous. YES! An amazing amount of English treats. And vitamins. I find this odd. A wall of vitamins. They’ve thought this through. You are attracted at first by the Easter chocolates when you first walk in. But it’s early and you still have resolve. Then you spot the Wall of Vitamins, and you think, “Yes! I can be healthy!”, so you buy some vitamins. And next to vitamins, you get your oats and lentils and dried kidney beans. Still good. And healthy. Then you have to walk by candy to get to healthy unsalted nuts, and by now, you are so pleased with your resolve, that you start to eye the candy. You bag your nuts. And while you bag your nuts you figure you could put just two or three of your favourite candies in those big plastic bags as a treat for later. 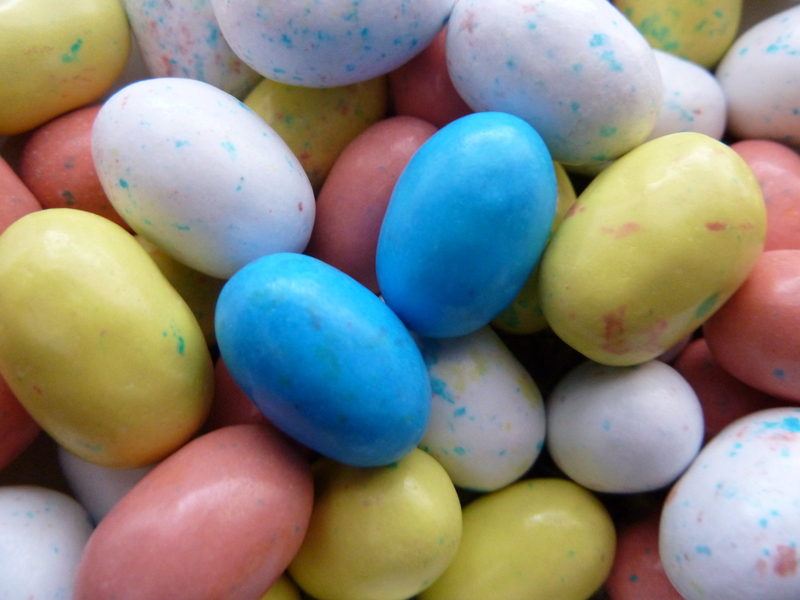 Then next thing you know, the pretty colours of the jelly beans, the shiny gloss of chocolate on the Bridge Mix and milky whiteness of the white chocolate almond bark overwhelm you, and the next few minutes of your life are a blur, then you come to while pressing OK on the ATM for a purchase of $29.00 of stuff you didn’t think you needed 15 minutes earlier. Very clever marketing. Very clever indeed.